• Classic stein glass. Will hold 2 pints, however the line on the glass is unofficial and may be slightly inaccurate. Product Features. New listingGERMAN BARLEY ETCHED CUT CRYSTAL GLASS LIDDED BEER STEIN . An attractive glass beer tankard decorated with barley etching. The lid also has a lion engraved on it. It is in great condition- no scratches, cracks or chips. Made from thick, dishwasher safe glass with comfortable, large handles. Capacity: 500ml. - Capacity: 500ml. 1 x Mini tankard for serving shots and spirits 40ml. Tankard Capacity: 1 L / 2pint. 1 x Classic Giant German Stein Glass 2 pint. Classic stein glass. Set of 1x German Beer Glass and 1x Mini Shot Glass. 1 Pint Icon Tankard Beer Stein. 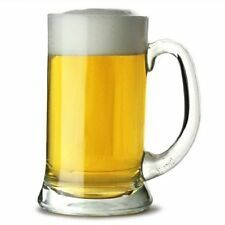 1 Beer Stein Glass Mug. Capacity:1 pint / 580 ml. Classic handled beer mug. Glass construction. Heavy weight base. Capacity: 422ml. Stein Beer Mugs Glasses With Handles422ml Set Of 2 Glass Beer Mugs Tankard Pint Glasses With Handles German Tankards Stein Beer Lager Party Mug Glasses. 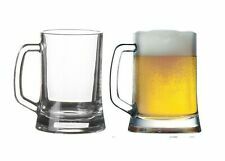 Set of 2 Beer Mugs Glasses With Handles Glass Beer Mugs Tankard Pint Glasses With Handles. • Classic stein glass. • Hand wash only. Will hold 2 pints, however the line on the glass is unofficial and may be slightly inaccurate. • Clear badge. Product Features. GREAT PIECE OF MANTIQUE COLLECTABLE. German glass stein/tankard with pewter lid. Has a etched deer design on it in colour. Used but still in a good usable condition. 7.75in (17.5cm) high including lid. German glass stein/tankard with pewter lid. Has a etched deer design on it. Used but still in a good usable condition. 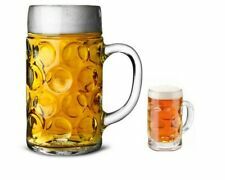 6 German Beer Stein Glass 2 Pint - Classic Beer Tankards, Beer Mugs, 2 Pint Glass,. Condition is New. Dispatched with Royal Mail 2nd Class. Here we have an old high quality crystal glass German beer stein pewter lid with hand painted black crowned Eagle gilt gold lines and engraved marks to the side of stein-0.54. There is a makers mark to the in side of the pewter lid G.TH.M. Unusual German stein. Heavy glass with pewter lid inlaid with ceramic. "HARRODS"-1849 LAGER GLASS AND PEWTER GERMAN STEIN...BY ZINN..OF GERMANY..
"""""""""""""""""""""""""HARRODS""""""""""""""""""""-1849 LAGER GLASS AND PEWTER GERMAN STEIN.BY ZINN. OF GERMANY. STAMPED ZINN ON THE INSIDE OF THE LID. BREWED AND BOTTLED ESPECIALLY FOR HARRODS BY HOFMARK BRAUEREI D-CHAM. Vintage GERMAN Glass Stein Musical Tankard Pewter Lid "Hiking Trip"
A Unique Stein with a MUSICAL PEWTER LID. Musical Pewter Lid. Hand wind musical pewter lid -. HEAVY GLASS BEER MUG with THUMB LIFT LID. Turn the horn on the lid, open the lid and a tune plays. featuring a mixed group hiking in the countryside. German Beer Stein. Bottom states 'Original BMF Bierseidel'. Antique German Glass Beer Stein circa 1904. Condition is Used. Ceramic lid with coat of arms.Painted inscription inside lid dated 1904. Eagle on hinge.Slight damage to lip and handle. 6.5 inches high Dispatched with Royal Mail 2nd Class. A Mid 19th Century German Cut Glass Stein - Fine Porcelain Plaque to Cover. A heavy hand blown clear glass stein with applied scrolling handle. The tapering vessel is panel cut - the base shows signs of genuine age. The overall condition is - Good. Wear and surface marks consistent with genuine age and usage. Ideal for display and quirky little shot glasses. Could be used to display cocktail sticks/tooth picks etc. in a cafe/restaurant setting. This is a very sweet set and very nice quality witha lovely bubble design around the body of each glass and a star cut base. The words roughly translate to "Honor to God, to the defence of our Neighbours" which is a fire fighter's slogan. Very Rare Collectors piece. This would also make a special Gift.